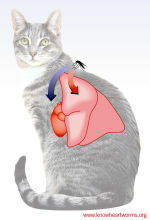 Heartworm is a parasite infection that occurs when a mosquito carrying microscopic heartworm larvae bites your cat. The larvae enter through the bite wound and settle in your cat’s tissues. The immature worms then enter a blood vessel and are carried to the arteries in the lung where they cause an inflammatory reaction. Most worms die at this stage, causing even more inflammation. The worms that progress to the adult stage can live undetected for a couple of years, but when the adult worms die, the inflammation can be severe enough to cause death. Can My Cat Get Heartworm? Feline heartworm disease has been diagnosed in all 50 US states. Wherever dogs are considered to be at risk for heartworms, cats are at risk as well. This is why it is so important for all cats to receive heartworm prevention. 1 in 4 cases of heartworm occurs in cats that live indoors. Since mosquitoes can get inside, indoor cats need protection, too. Even 1 immature heartworm can permanently affect your cat’s health and ability to breathe by causing an inflammatory reaction in the blood vessels and lungs. 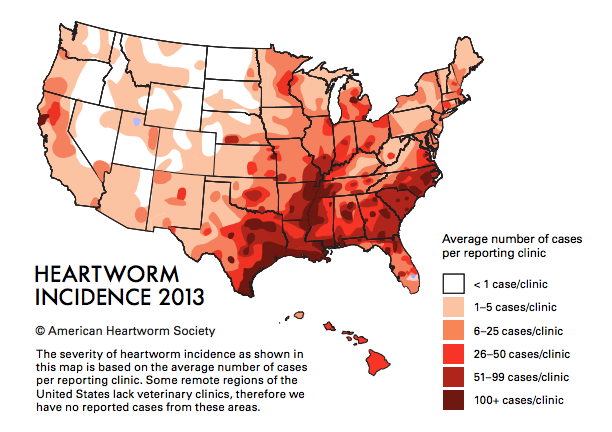 The American Heartworm Society recommends year-round prevention regardless of the time or year or the US state you live in. You should discuss prevention with your veterinarian at your annual preventive care examination. The risk of kittens getting heartworm disease is equal to that of adult cats. 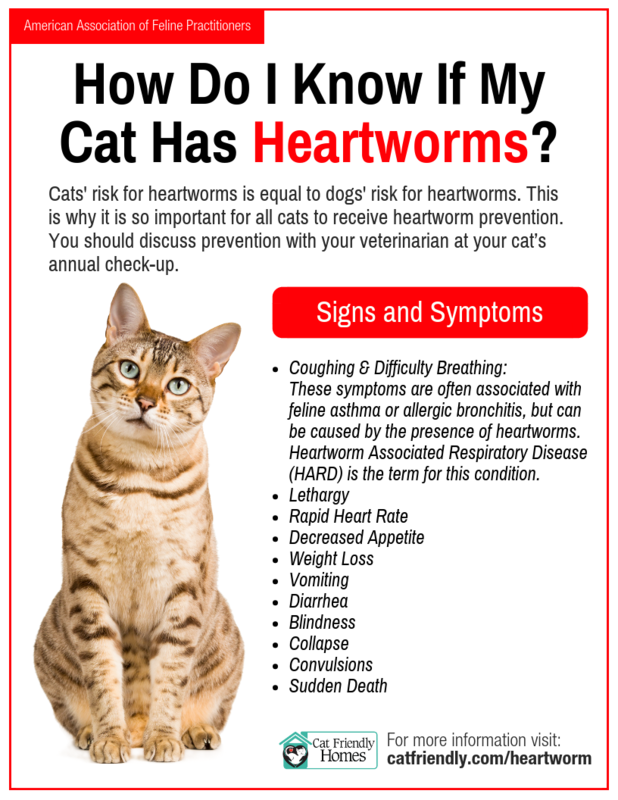 You can prevent heartworm by consulting with your veterinarian and having year-round protection for your cat. Parasite prevention is vital in keeping your cat healthy. There are no approved medications for treating heartworm in cats. If your cat develops a heartworm infection, you and your veterinarian can only manage, not treat your cat’s condition. For more information on treatment guidelines visit the American Heartworm Society website.